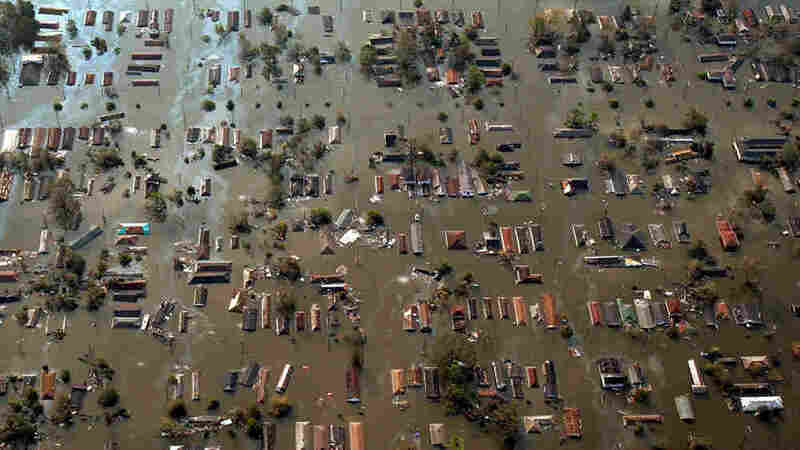 The Legacy Of Hurricane Katrina : The Picture Show Telling Their Stories is an emotional and moving retrospective of the powerful images made in the aftermath of Katrina. 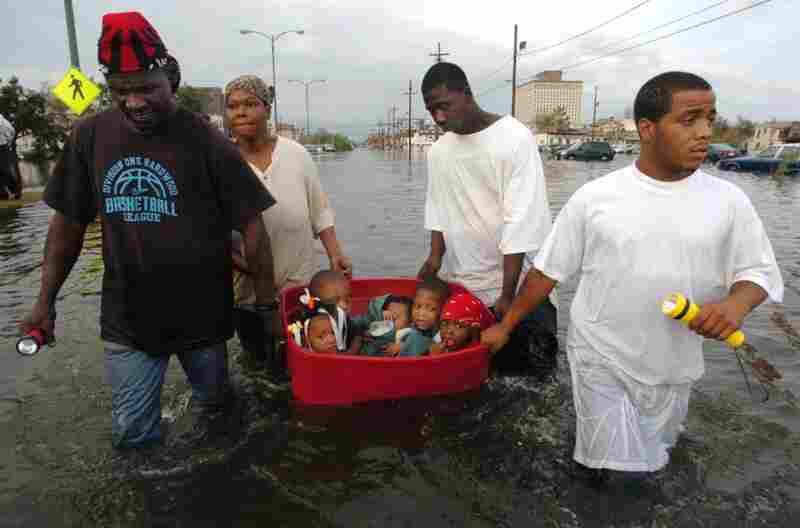 “Telling Their Stories: The Lingering Legacy of the Hurricane Katrina Photographs” is the title of a new exhibit at the Ogden Museum in New Orleans. The exhibit is an emotional and moving retrospective of the powerful images made in the aftermath of Katrina. 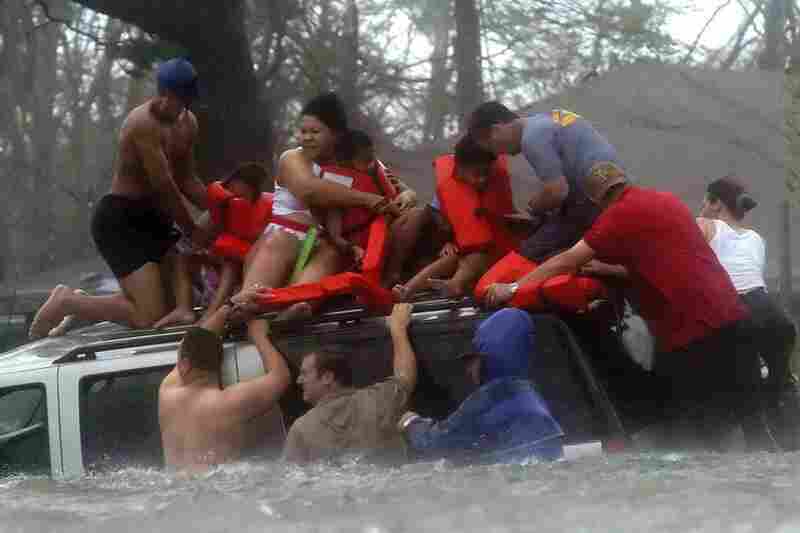 Bay St. Louis Emergency Management Agency volunteer crews rescue the Taylor family from the roof of their Suburban, which became trapped on U.S. 90 due to flooding during Hurricane Katrina on Aug. 28, 2005. 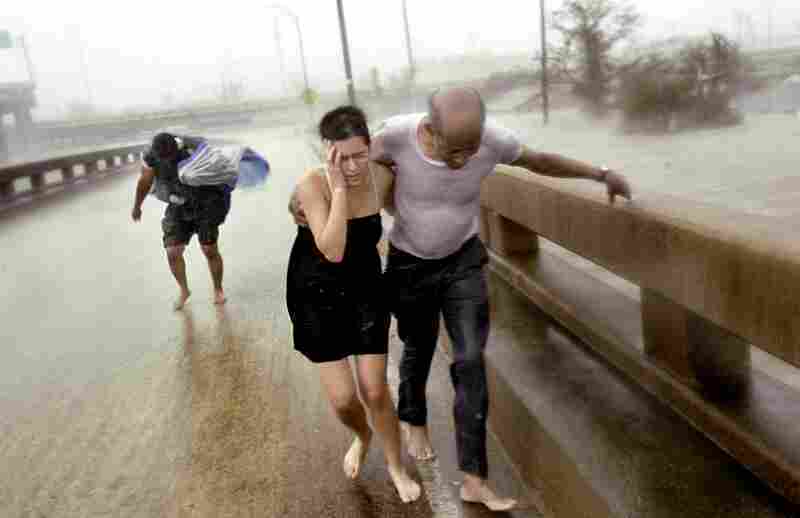 Otis Brown, 67, holds on to Jennifer Cooper, 33, as they fight their way through the wind driven rain of Hurricane Katrina with Albert Jean, 50, up an Interstate 610 off-ramp after escaping roof-level floodwaters in the Clermont Driver area of New Orleans. The three were part of a larger group who escaped the floodwaters by taking an aluminum motorboat to the off-ramp on Aug. 29, 2005. 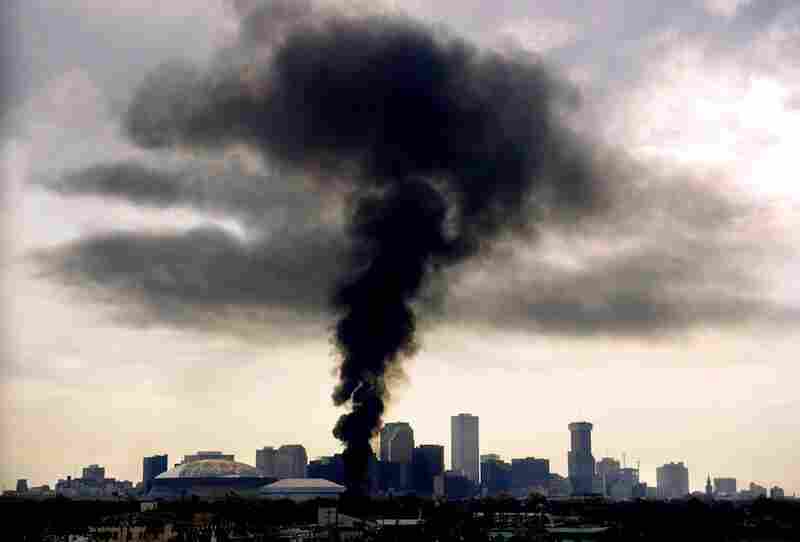 Fire rages unimpeded Aug. 30, 2005, the morning after Hurricane Katrina hit New Orleans. The flooding of New Orleans was well underway by Monday afternoon as John Rainey, John Rainey, Jr. and Courtney Davis helped Terry Fox tug a tub full of children to higher ground on South Broad Street on Aug. 29, 2005. 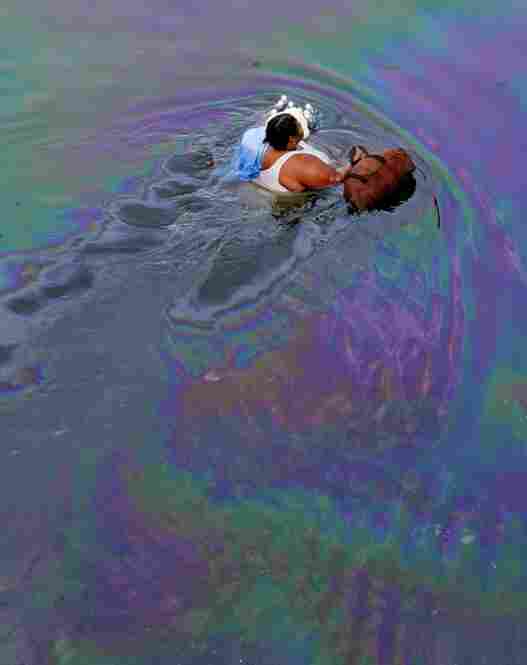 A New Orleans resident wades through floodwaters coated with a fine layer of oil in the flooded downtown area on Aug. 30, 2005. The Interstate 10 Causeway Blvd cloverleaf became an evacuation staging area on Aug. 28, 2005. 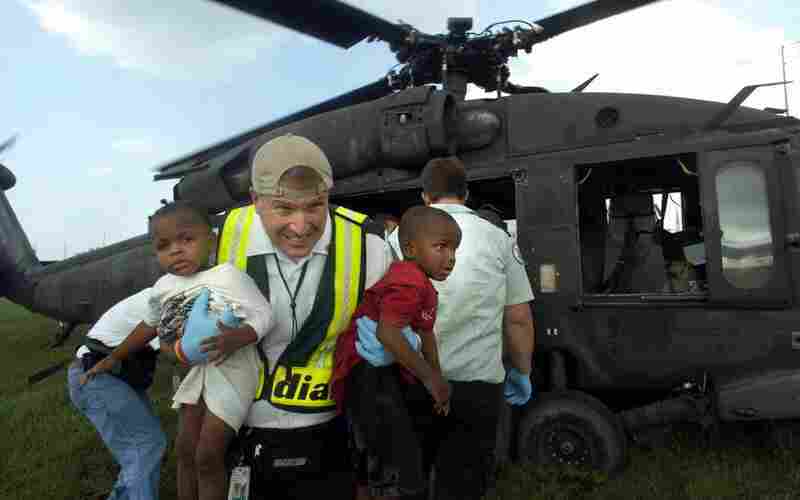 Amid the sea of organized chaos, Jeff Thibodaux with Acadian Ambulance rushed two small children from a Blackhawk helicopter after being evacuated from the Louisiana Superdome. 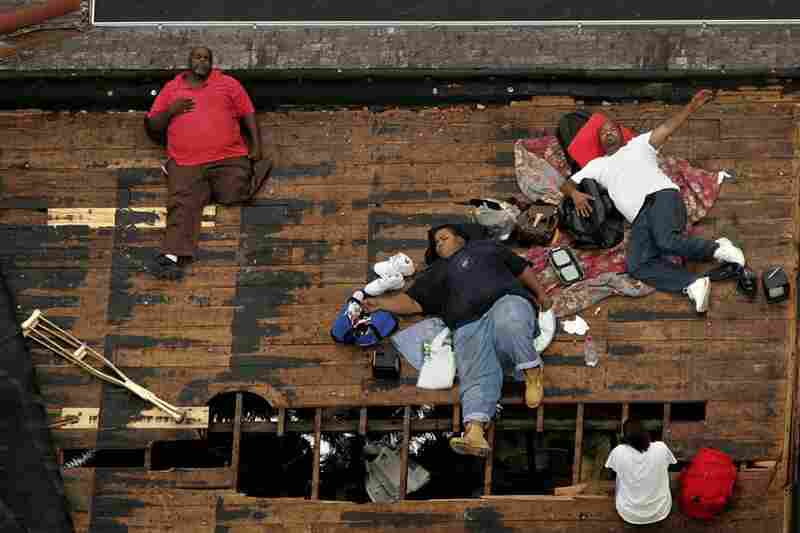 Residents, including a man with only one leg, wait on a rooftop to be rescued from the floodwaters of New Orleans on Sept. 1, 2005, as officials evacuate the city after Hurricane Katrina. Orleans Parish prisoners are held on an overpass on Aug. 30, 2005. 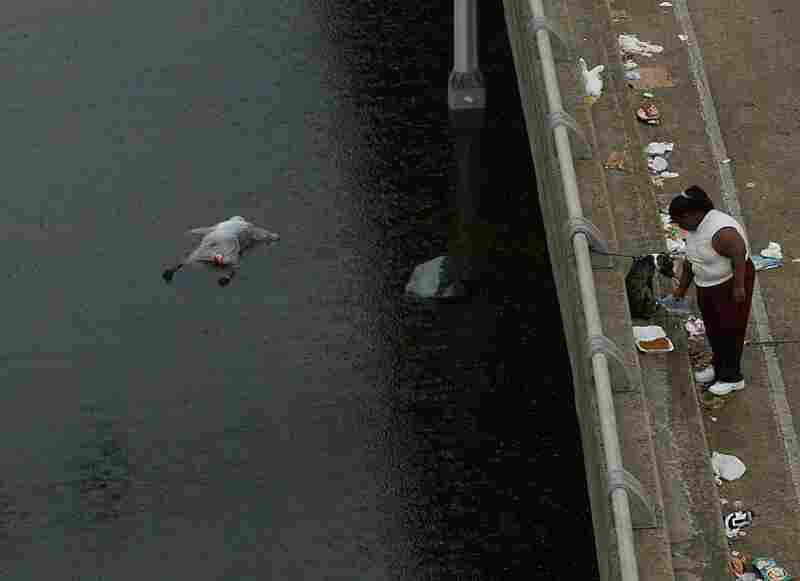 A body floats in the floodwaters of New Orleans in the aftermath of Hurricane Katrina on Sept. 1, 2005. 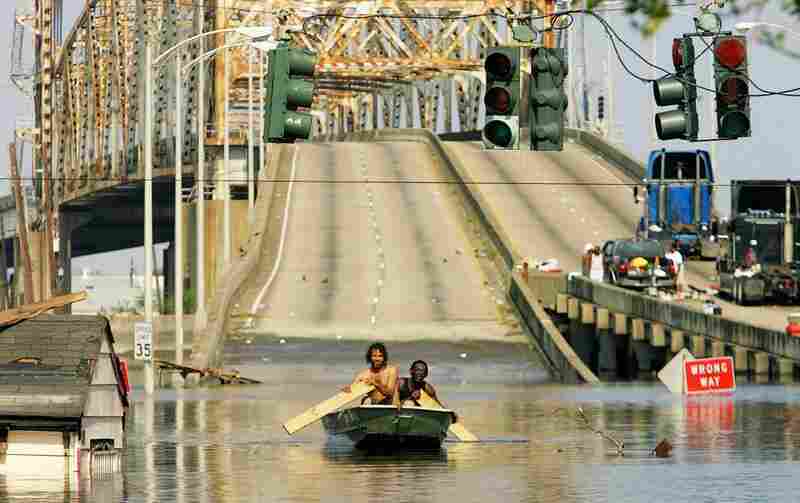 Two men paddle in high water after Hurricane Katrina devastated the area on Aug. 31, 2005. A sandbag is lowered into the broken section of the London Avenue Canal levee breach on Sept. 4, 2005, in New Orleans following Hurricane Katrina. 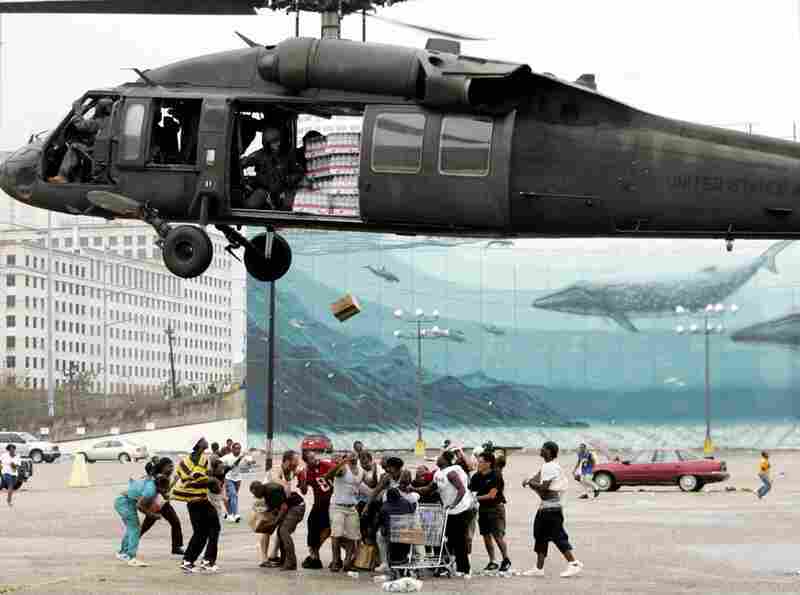 A military helicopter makes a food and water drop to flood victims near the convention center on Sept. 1, 2005. Officials called for a mandatory evacuation of the city, but many residents remained in the city and had to be rescued from flooded homes and hotels. 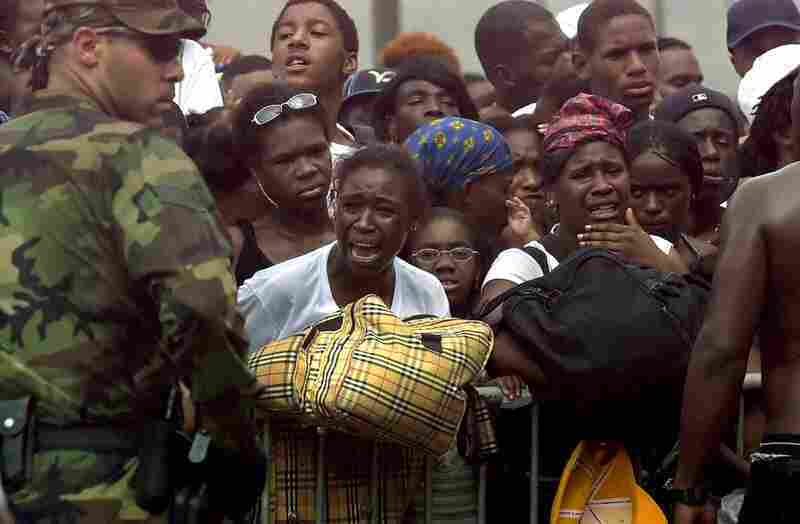 Victims of Hurricane Katrina argue with National Guard Troops as they try to get on buses headed to Houston on Sept. 1, 2005. Frustration was building as evacuees had been cooped up in the Superdome under very primitive conditions for days. Lee Ann Bemboom seeks help for her 11-month-old son Jahon who became dehydrated while they were stranded for days at the Ernest N. Morial Convention Center on Sept. 1, 2005. After waiting in vain, she left looking for help elsewhere. A young boy covers his face from the stench of the two bodies left by the side entrance of the Ernest N. Morial Convention Center in New Orleans on Sept. 2, 2005. The mantle over the Robinson household in the ninth ward on Burgundy street shows the effects of the flood water on Oct. 12, 2005. 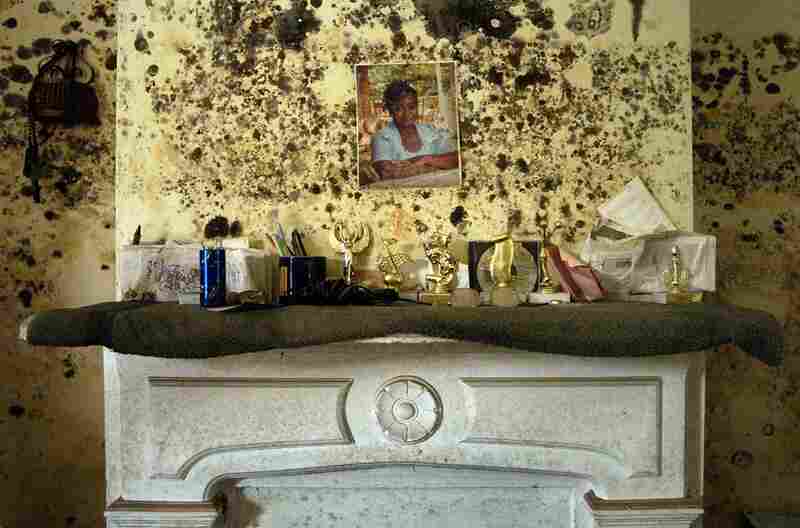 There was little to save from the house that took over six feet of water from Hurricane Katrina. 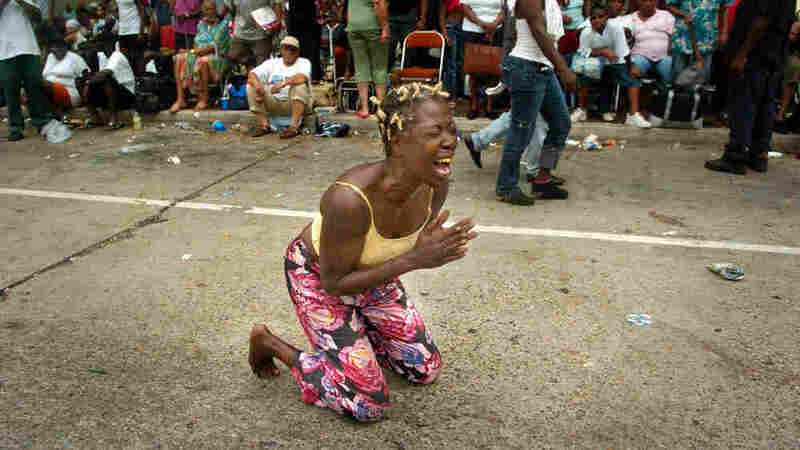 Leonard Thomas, 23, cries after a SWAT team burst into the flooded home he and his family were living in New Orleans on Sept. 5, 2005. 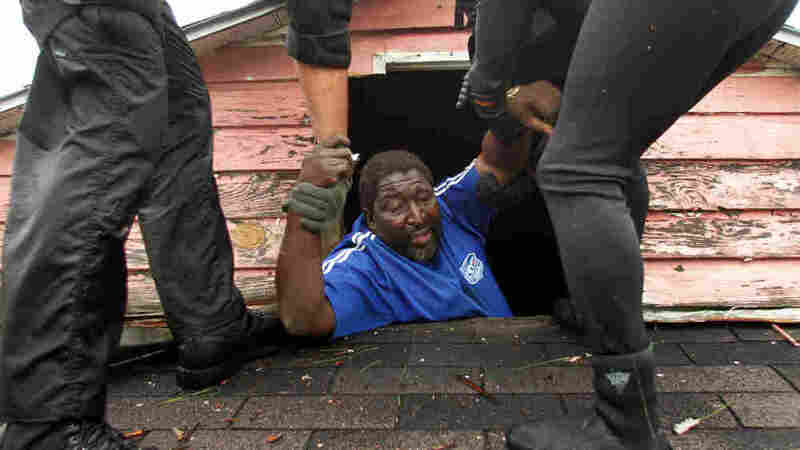 Neighbors had reported that they were squatting in the house in the wake of Hurricane Katrina but the authorities left after his family proved they owned the house. 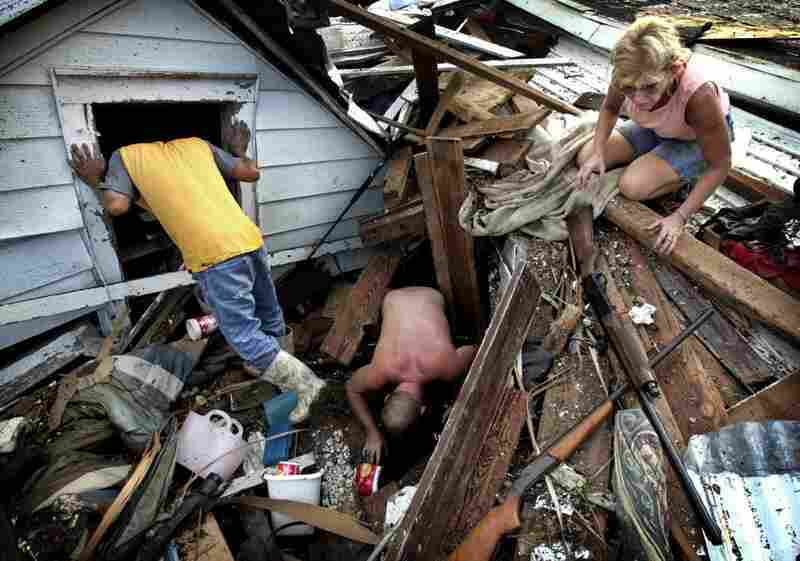 Residents dig through the rubble of what is left of their home in Biloxi, Miss, on Aug. 31, 2005, following Hurricane Katrina. 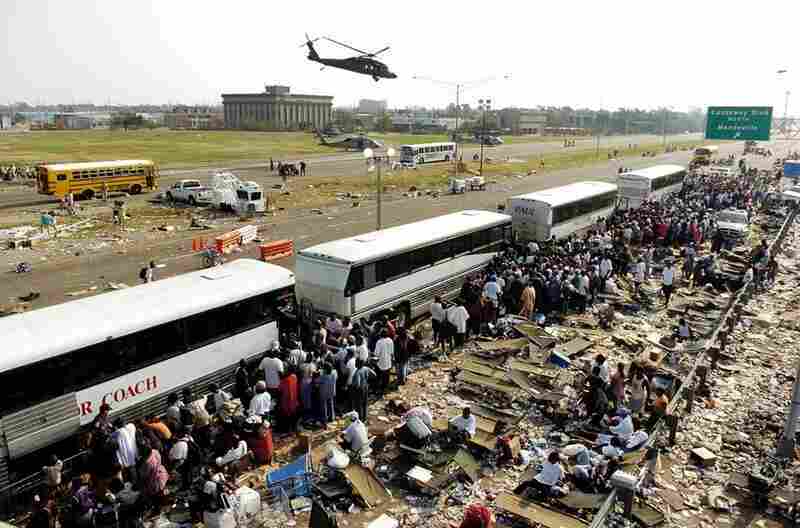 As some in dire need are airlifted out, others cram onto buses and wait to be evacuated from a refuge area at Causeway and I-10 in New Orleans on Sept. 3, 2005. 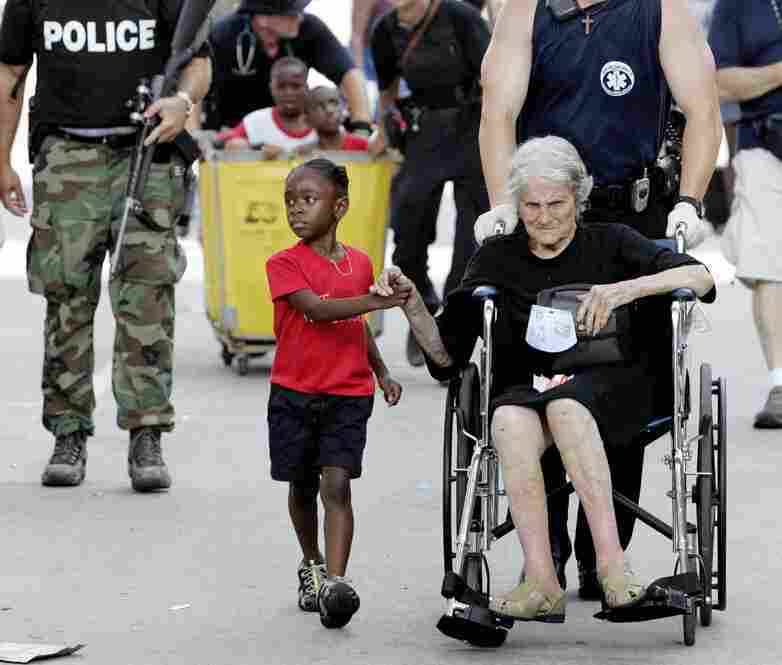 Tanisha Blevin, 5, holds the hand of fellow Hurricane Katrina victim Nita LaGarde, 105, as they are evacuated from Ernest N. Morial Convention Center on Sept. 3, 2005. 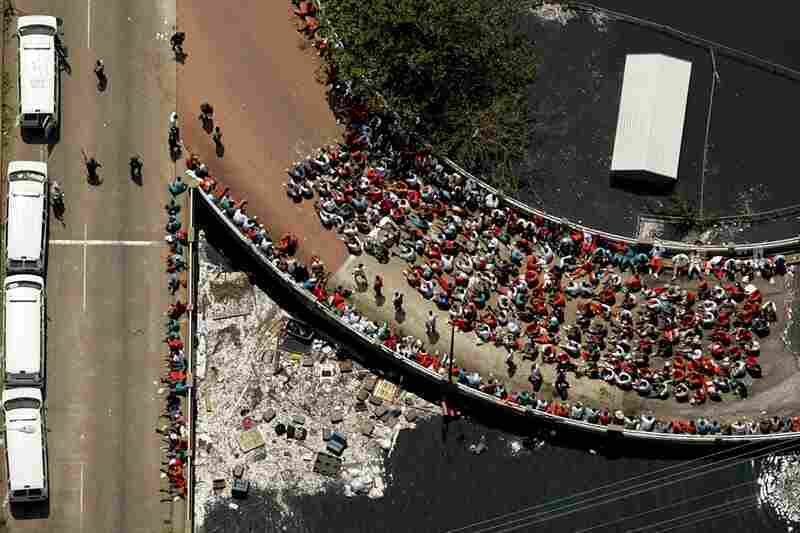 Hundreds of people waited several days to be evacuated. 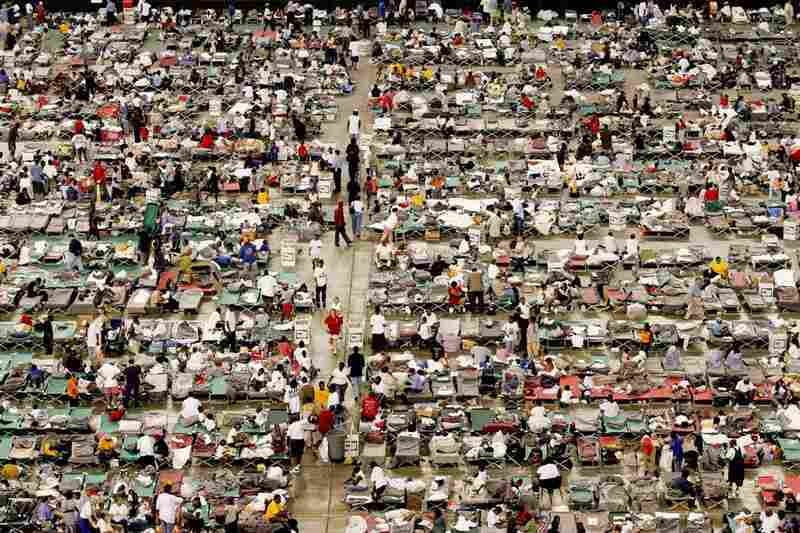 After Hurricane Katrina flooded New Orleans, more than 15,000 evacuees had to be transported to a makeshift shelter at the Astrodome in Houston, Sept. 2, 2005. 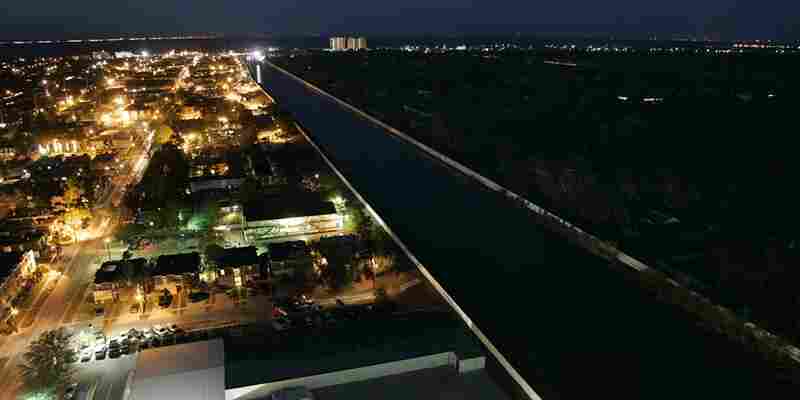 The lights of Metairie seem even brighter, when just across the 17th Street Canal New Orleans is a sea of darkness, Sept. 18. 2005. The exhibition opened this past Thursday to crowd of about 250 people, and was part of a weekend that also featured a day-long photo workshop for local students, a panel discussion with Gulf Coast photojournalists, and a seminar with a keynote address by historian Douglas Brinkley. The collection of photographs is a sobering reminder of the anguish that the Gulf Coast experienced in the days following Katrina. 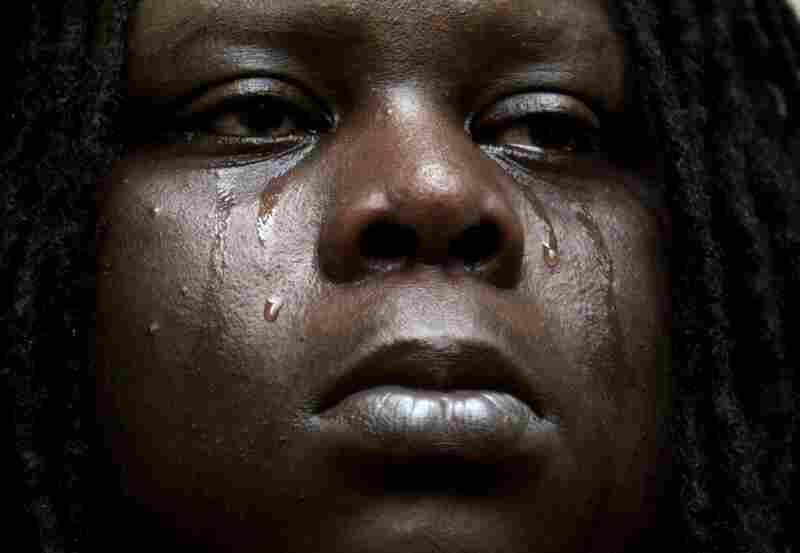 Even five years later, the images are haunting – the torment and grief of the subjects is almost painful to view. The project was born after Smiley Pool, Chief Photographer and Photo Coach at the Houston Chronicle, had been talking with colleagues about what they could do to bring photojournalists together in an age when the industry is suffering somewhat of an identity crisis. 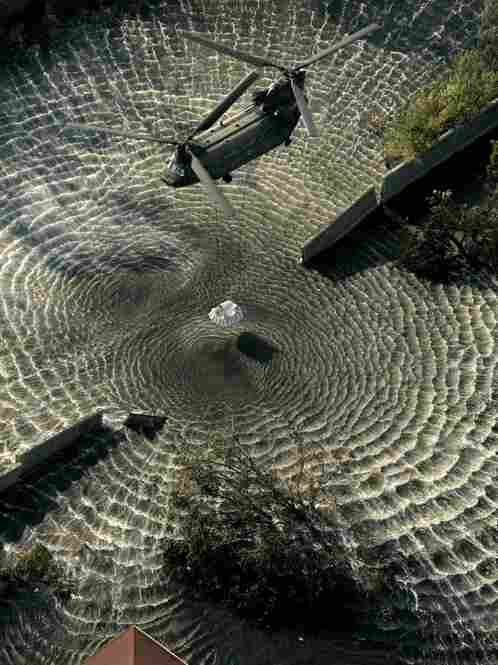 “We can talk among ourselves, but we are preaching to the choir. What can we do to bring photographers together?” he asked. This past April, he and fellow NPPA member and Baton Rouge Advocate photo editor Kevin Martin started thinking. “We said to ourselves, ‘If you were looking for meaning and purpose in the production of photojournalism, the most recent galvanizing event where the press was welcomed with a camera -- where we had a common purpose -- was Katrina,’” said Pool. Martin, Pool and Ted Jackson, a photographer at the Times-Picayune, decided to curate an exhibit that would compile some of the best work from Katrina, but they also wanted to include an educational component that would bring the community together. Almost 600 submissions came in from NPPA members, and beyond. In July, Tom Kennedy, Ron Londen, Tim Rasmussen, and Bruce Strong chose 100 of the strongest images during the NPPA Convergence meeting in Charleston. David Houston, curator at the Ogden Museum, later narrowed it down to 53. These photos represent some of the best and most memorable photojournalism from the days and weeks following the storm. But the photojournalists involved in Telling Their Stories weren’t only looking back on history, but helping to move the conversation forward. During the weekend, they hosted a workshop for local students, ranging in age from 11-21. Under the guidance of the professional photographers, students spent the day shooting in New Orleans, and the photos were shown in a slideshow on Saturday at the museum. “The kids really hit it out of the yard,” said Pool. 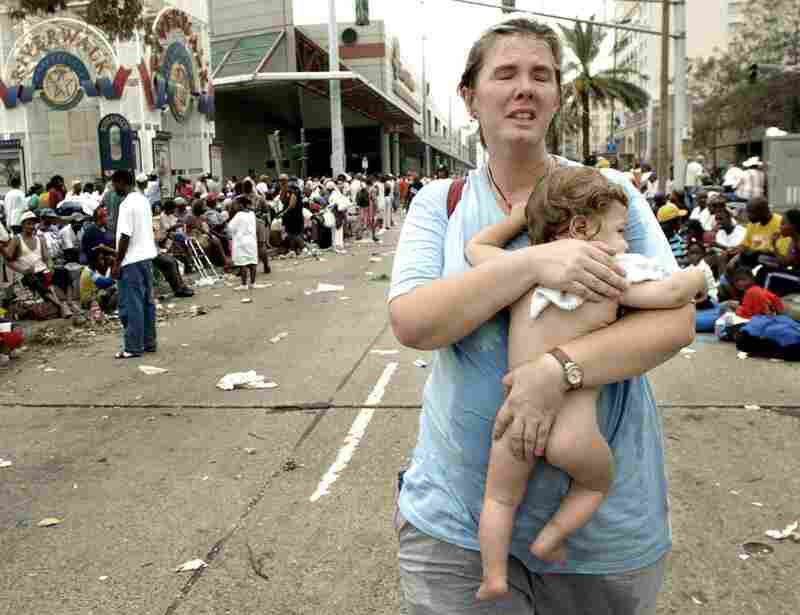 See photographer Mario Tama's images from post-Katrina New Orleans on The Picture Show.